The role of the book blurb is to get the reader interested enough to want to read the book. Book blurbs can be a challenge for writers since they often contain spoilers that the author would rather be revealed as the story progresses. However, the spoilers are usually what makes the book interesting in the first place. If you cannot get the reader interested in the book enough to read it, the spoilers will never be revealed so it is best to give it up in the blurb. I love the cover, very eye-catching and beautiful. The red heel is striking, while the mechanical parts, shown under the skin, alludes to science fiction. Next, most potential readers will go to the book blurb. The first paragraph of the blurb does a great job of describing the precariousness of life in the future city of New Beijing: ‘raucous streets’, ‘plague ravages’ and ‘ruthless lunar people watch, waiting’. The people of Earth are weakened and on the brink of war. This future Earth sounds like a very scary place and the short sentences accentuate it. The second paragraph of the blurb falls flat for me. It feels like one big cliche with too familiar references to the ‘Cinderella’ fairy tale. The protagonist, mistreated and unloved, falls for the handsome prince. The tag line ‘Even in the future, the story begins with Once Upon A Time…‘ contains the most overused cliche of all. The only difference is that high stakes are involved: the future of Earth. She is apparently the only one who can save the world. The last line of the blurb hints at something mysterious, but I managed to guess what it was within the first four chapters. However, there are enough other twists and turns in this extremely well-written book to keep you interested. The screw through Cinder’s ankle had rusted, the engraved cross marks worn to a mangled circle. This is where the blurb plays an integral role in helping inform the reader so they are not utterly confused by the first line. If there was no blurb, the reader may get the impression that Cinder maybe undergoing a medical procedure. But the blurb has already told the reader that Cinder is a cyborg, so the line makes sense. The importance of the blurb cannot be understated. It is as integral to the book as the first chapter. The blurb is the author’s first opportunity to interest the reader in the protagonist, the setting and the conflict. Her knuckles ached from forcing the screwdriver into the joint as she struggled to loosen the screw one gritting twist after another. Anyone can remember a time when their body ached, and they had to grit their teeth while performing a strenuous task. The next few paragraphs continue in this vein where ‘she slumped back with a relieved groan.‘ What you learn is she is struggling to remove an undersized prosthetic foot from her ankle. It makes you feel bad for her. It raises questions as to why she’d been forced to use an incorrectly sized foot. And will she be leaving this foot behind, instead of a shoe, when she leaves the ball? Fortunately, the plot does not follow the fairy tale that closely. What is interesting about these paragraphs is that while Cinder is trying to remove her too small prosthetic foot from her ankle, the reader has no idea of the setting. Meyer describes the actions and feelings of Cinder so thoroughly, the reader doesn’t even notice they do not know where Cinder is. 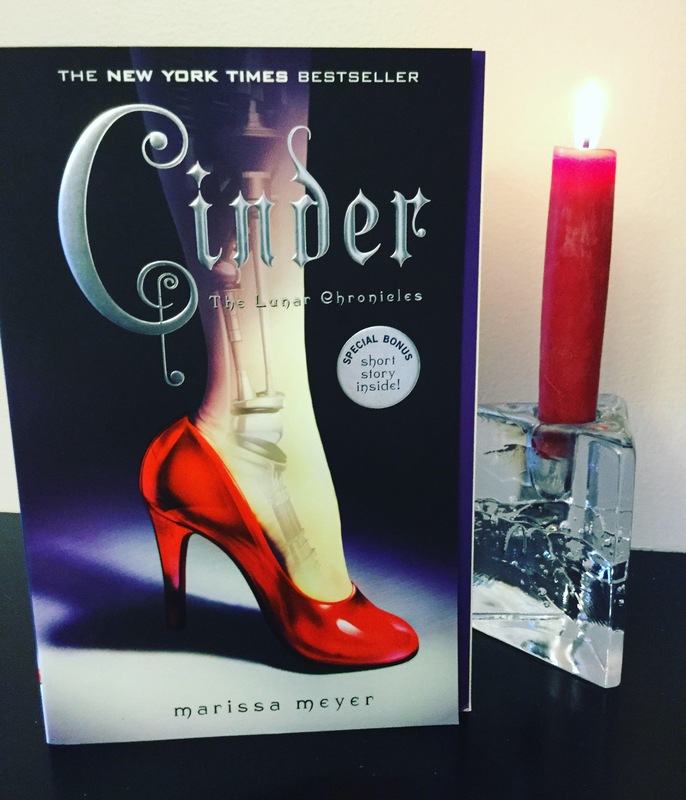 Although the book is written in the limited 3rd point of view, Meyer gets the reader so deep into Cinder’s head, it feels natural to only know what Cinder is feeling and thinking. I am impressed with Meyer’s ability to do this. Cinder knew they really just didn’t like being next to her. In the first four paragraphs of the book, Cinder’s most important characteristics are shown. She is capable yet ill-treated and ostracized by the majority of the population for being part cyborg. The rest of the first chapter makes you identify with Cinder even further. Her feelings are hurt when a mother admonishes her son for playing near Cinder. It’s not like wires are contagious. She also tries to hide her cyborg parts from the prince during an awkward encounter at her booth. What girl hasn’t tried to hide a pimple or acted like a complete dork around a guy she likes? Meyer has created a very enjoyable story with a well-rounded protagonist and cleverly written secondary characters. I am reading books differently now. Sometimes I get a feeling when I am reading, then I go back to figure out how the author did it. Thanks for the encouragement. When you asked me to click on a book, I chose the book with the red shoe easily. I love red shoes, so this visual alone prompted me to investigate this book further. I like the main character’s name, Cinder. It’s different and makes me curious to know more about her. Seeing the artificial prosthetic inside her leg gave me pause. Why is it there? What does it make her? I thought back to the old Harrison Ford movie “Blade Runner,” where the beautiful lady he was supposed to put down wasn’t human. He fell in love with her, and she lived on, but there were a few tense moments. And the other “Replicants” didn’t fair as well as she. If I were actually reads books right now instead of blog-hopping as much as I do, I would most likely give this book a whirl. Your write-up makes it very appealing! Thanks for clicking on a book! And yes, the cover of Cinder is awesome. So glad you enjoyed my write up. Enter your email address to follow this blog and receive notifications of new posts by email. No spam will follow. Julia loves animals, the environment, and wacky characters whether fictional or real, which figure prominently in her first fantasy novel.